Founded in the 1800s, Great-West is a financial services powerhouse with headquarters in Denver, Colorado. Its life insurance division is the nation’s second largest insurer of individual life insurance through banks. 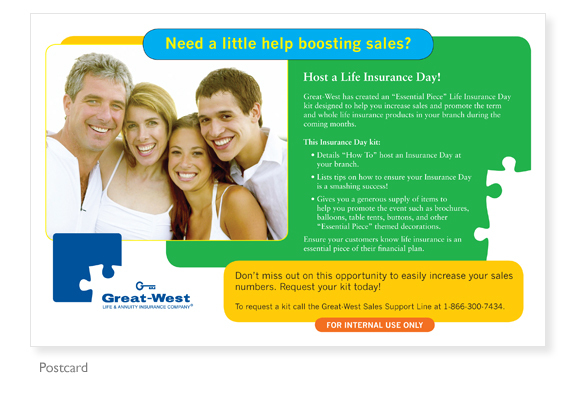 To encourage the bank partners to participate in Great-West's life insurance sales program, an incentive campaign was needed. 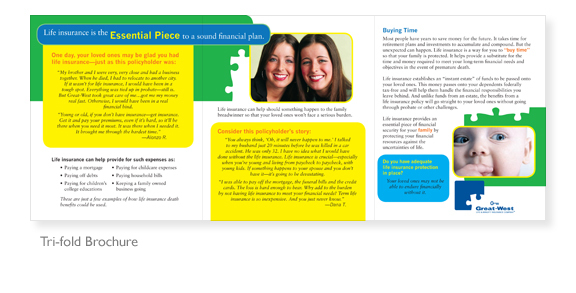 JJS Design (working for Great-West) developed, "The Essential Piece" campaign. This campaign featuring a custom logo which merged a simple puzzle piece and the "G," suggesting the negative space of the puzzle piece. In addition to emphasizing the concept that life insurance is "The Essential Piece," this solution also solves the challenge of maintaining the integrity of the corporate mark.